Dive support for pre-lay pipeline route investigation. This project required pinpoint navigation and positioning of vessel in three point moor over various utility crossings. This project was particularly challenging due to swift currents, shallow water depths, and limited maneuvering area. The ATLANTIC SURVEYOR have been utilized by the Department of the Interior, US Geological Survey in their ongoing sea floor mapping efforts over the past four years. 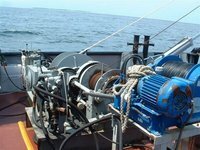 These surveys include side scan, multi-beam, sub-bottom profiling, and bottom sampling. We were also employed by SAIC on the hydrographic survey on Long Island Sound and Vineyard Sound. While conducting these surveys the vessel ran over 7,500 kilometers of survey lines, resulting the most detailed hydrographic survey ever conducted in the United States. Naval Undersea Warfare Center headquartered in Newport, RI, regularly employs the ATLANTIC SURVEYOR during weapon testing operations involving both surface and submerged naval units. The ATLANTIC SURVEYOR serves as the designated Range Command and Control Vessel during the actual firing exercises and is employed as the recovery vessel should bottom recovery of fired units be required. In these situations, the vessel deploys one the the Navy's large ROV systems, i.e., DEEP DRONE or TRITON for recovery ops. The ATLANTIC SURVEYOR participated in several downed aircraft search and recovery operations, including the recovery of two F-16s; one off the coast of New Jersey and another off the coast of North Carolina. However, the most demanding of any search and recovery operations undertaken by the crew of the ATLANTIC SURVEYOR (and her sister ship, the M/V Pirouette) were the efforts immediately following the crash of TWA FLIGHT 800 into the waters off Long Island, New York. 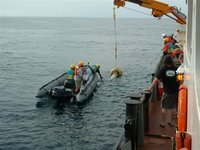 Divemaster's vessels and crew were put into service by the US Navy on the first day of the recovery operations, and were on the job until completion some ten months later.